This was a fun challenge. 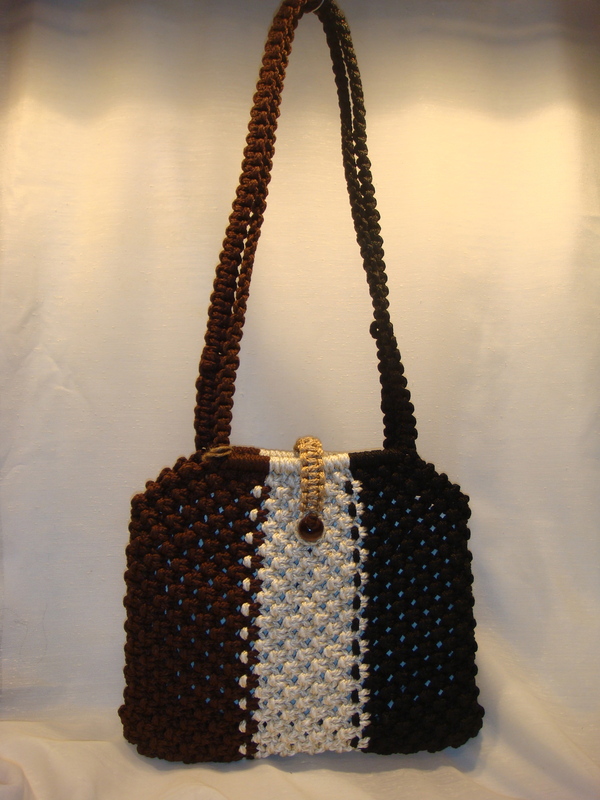 I found this pattern in one of my macrame books, but the purse was attached to a set of ten inch rings at the top. They were to be used as the shoulder straps. I used to make most of my purse that way back in the day, that does not appeal to me now (if you like rings for a shoulder strap, let me know). The other thing I have noticed about any pattern that has wooden handles, especially the smaller bags, is when you look inside, the opening is too small. It does not allow easy access to your stuff. The last part of this challenge was the color. Because I was not going to use a ring or a wooden handle, the cord coming down into the body of the purse needed to be the same as the intended body color. A square knot consists of two cords folded in half. For a shoulder strap, you take 4 cords and lay them out flat, two longer ones on the outside and two shorter on the inside. In this case, I cut all 4 cords, two black on the outside and two brown to the inside, what the longer length would be in a regular pattern, laying them evenly next to each other and made a row of square knots 16″ long starting from the middle. Then unpin and turn it around, switch the brown and black cords positions, outside cords to the inside and continue another 16″. Now that the strap is complete, there will be two black cords hanging at the bottom of the brown side and visa versa with the black strap side. Placing the strap in half untwisted, I pinned the last knots to a board and took the black from the brown side and the brown from the black side and pinned them 90 degrees toward the opposite strap bottom leaving about 6″ space between strap bottoms; this will form a D on its back. Now all cords are on the side they should be. The beige cords were then mounted over the 4 cords between the straps and additional brown and black cords to their sides. At this point the body of the purse can be started. So far these steps have taken care of replacing the rings for straps and the color dilemma. To take care of the narrow problem, a single cord was added to each side for four rows to increase the opening for easy access. To ensure that the contents will not fall out if the purse if it’s dropped, a tab closure is added to the back and slides over the bead in the front to latch. 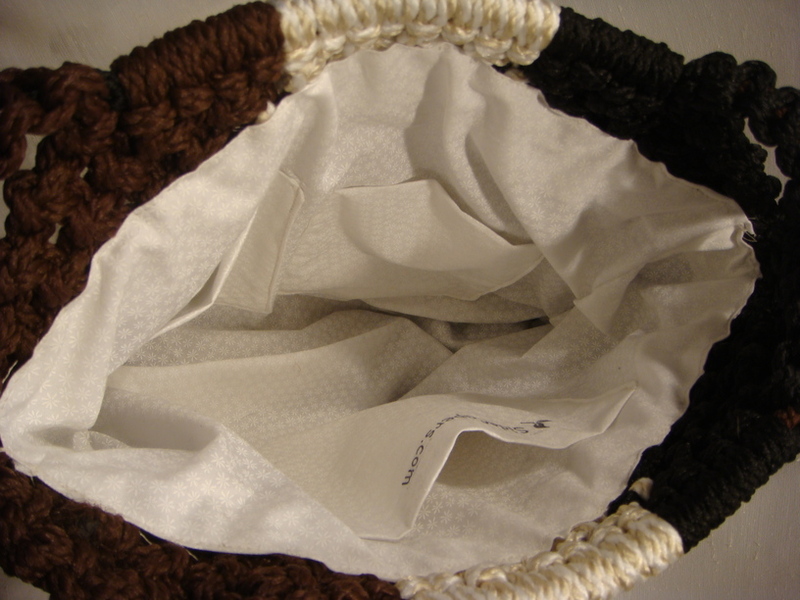 As you can see the inside of the purse is nice and wide when pulled open. I like the daisy pattern on the fabric. This purse has three great pockets for the items you wish to get at right away like your phone or glasses. Let me know your thoughts on this project and share it with others. 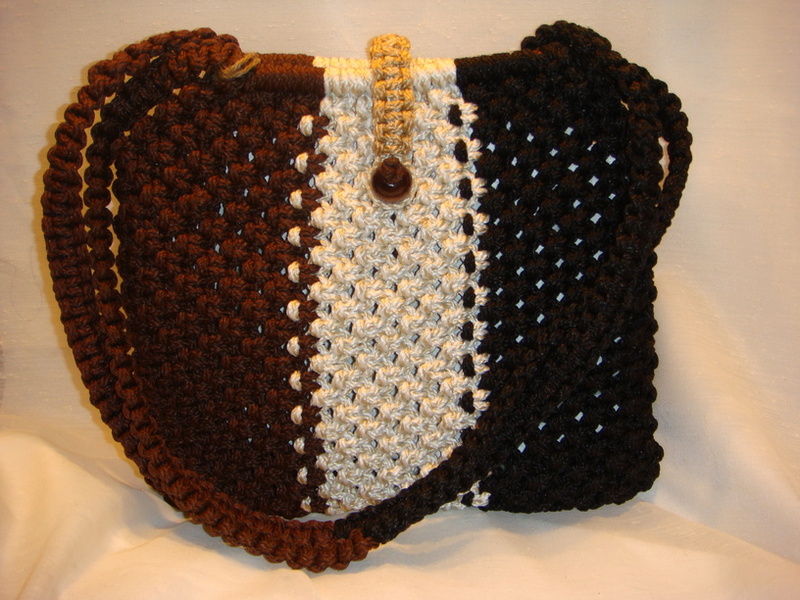 This entry was posted in Finished Projects, How-To, Main Page and tagged closures, macrame, macrame purse, purse, square knots, strap. Bookmark the permalink.